Do you say, "I can’t meditate"? Just do this … sit comfortably, eyes closed. Notice your breathing. Notice your inbreath, notice the end of your inbreath, notice your outbreath, notice the end of your outbreath. Your breathing will naturally become deeper. Remain gently focused on your breathing. If your mind wanders, return to your breath. 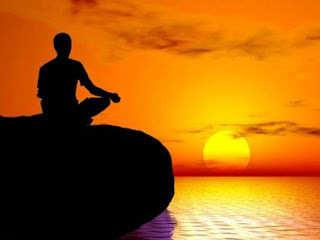 Now you are meditating – no books, no courses, no stress. A few months ago while I was training for the triathlon, I got a speeding ticket while driving back from Malibu. I had a few other things I had to do that day; have lunch with a friend in LB, volunteer at this event in Silverlake, and go back to LA to get ready to take a few out of towners on a night tour of the city. So that ticket definitely got me depressed. It’s draining having to think about paying 500 dollars for something like that. I went home pretty beat up and exhausted. Then… I had a dream. In my dream, I was going to be late for something. I was running to my car. As I was about to get in, our maid said she found a few “loose screws” on the headlights. (Weird) I said I’d deal with it later. Once inside about to start the ignition, I found my cousin eating something savory in the back seat! I panicked, thinking he might spill something! Then my younger sister started climbing into the passenger seat, wanting to talk to me about her life. I felt overwhelmed. I don’t have time for this right now, I thought to myself. I’m going to be late! I just wasn’t sure what I was going to be late for! So I yelled for both of them to get out of the car… I started driving before they even got the chance to hop out. I felt annoyed at them for stalling me. Then all of a sudden, after moving for just a few meters, a big wave started to wash down my entire street. It looked like a dam has broken somewhere and the water came rushing down to us… or to ME. The car was hit! The windows were open. Water filled the car. There were bubbles. Bubbles everywhere! Everything happened so fast, I didn’t have a chance to properly react. All I remember thinking was that I thought I was going to drown. Then just like that, the water subsided… Just as quickly as it started, the waves disappeared. I got out of the car, and yelled – WHAT THE HELL was that?? First thing I did was check my phone. I had a few messages. One from a friend who asked if I could still drive her somewhere, the other confirming lunch, the other asking if I could still go with him to do this game show thingie. After reading the messages, I got overwhelmed, and I felt the same panic I felt in my dream. The speeding ticket that I got was probably the Universe’s way of telling me to slow down. I was spreading myself too thin, overwhelmed by all the commitments I’ve been making. I needed to calm down. When I told my friend, L, about my 30by30 project, she got a little concerned for me. She said she thought I might be overworking myself, and that one day I might crack. Her advise for me to figure out what I really want to do was to bask in silence for a change. She said that only when my mind is still will my heart start talking to me. She suggested that I tried meditation. I never really thought of it again till that day with the speeding ticket. L was right. I needed a little bit of peace. So I went out in search of a place where I could meditate, with people who could TEACH me how. I found this Buddhist place in Glendale called Shambhala Meditation Center. They had “public sittings” that allowed anyone to come in and meditate with them for free. Excellent! I love Buddhists, and I love freebies! After I told her my story, she nodded, as if to say she understood. Then she told me a little bit about what they do in Shambhala. She said that contrary to what people think, meditation is not necessarily about clearing one’s mind. She said for them, it’s about concentrating on your breath, and your breath alone. Being conscious of how the air travels through your nose to your lungs, giving you life. They also meditate with their eyes open, because they want you to be awake and be aware. But man, she wasn’t kidding. It was pretty hard to stare and focus just on your breath. My chaotic mind kept interrupting my state with random images, thoughts and stupid ideas. I was about to get really frustrated with myself when I remembered what she said about being gentle and kind to myself. Deep breaths. Then go back… Deep breaths… then go back. After 5 minutes with her, she put me in the public sitting room so I could meditate with the others. We had about an hour to go. I only lasted 20 minutes. But it’s okay. Because I am being gentle and kind to myself. It’s really difficult if your mind is not used to focusing on just one thing for an hour. And 20 minutes is a great accomplishment! Fast forward to a few months later, I’ve actually meditated on my own a few times. I’m not going to sit here and say it’s life changing and that I’ve found my center or whatever… But I know I feel physically calmer after I do it. And I think it’s a good thing that I can always meditate every time I feel like I need to slow myself down. So… Am I going to be a Buddhist Guru or a Meditating Monk? I doubt it. But I’m slowly learning to pace myself though. And maybe with practice, who knows? I might just find my path to enlightenment!